Quick and Easy BranchCache Setup. This article provides instructions on how to implement BranchCache. Primary office in Atlanta (ATL). Branch offices in Chicago (CHI) and Washington D.C (DCA). CHI and ATL host local file servers (i.e., hosted cache mode). DCA is the only office without a dedicated file server (i.e., distributed cache mode). All clients use Windows Enterprise. Install the BranchCache Role and Feature. Step 1. Add Roles and Features. Run the Add Roles and Features Wizard on each file server. Install the (a) BranchCache for Network Files Role; and (b)the BranchCache Feature. BranchCache stores files in two directories: (a) HashCache and (b) DataCache. File servers store file hashes in the HashCache directory. Remote Hosted Cache servers, as well as Distributed Cache clients, use files hashes for content tracking and updates. The DataCache directory stores content derived from the hash. This directory contains cached remote content (i.e., files) that are served to local clients. Both directories are stored on the system drive -not good! Additional caching attributes will be configured via Group Policy (Step 4). BranchCache SSL certificates support Windows 7 clients. It's not necessary for organizations with only Windows 8 or Windows 10 clients. Of course, the file server will probably require certificates for other services -just not BranchCache. Add a server certificate in the personal certificate directory for each BranchCache hosted cache server (e.g., ATL and CHI). N.B., CERTHASH is the certificate's thumbprint. Further certificate information found here. Use Group Policies to adjust caching attributes and client settings. Table 1. BranchCache Policy for File Servers. (Hash publication for all shared folders). Set as low as 4KB. N.B., Low values may impact performance. Note: BranchCache for network files uses round trip latency. Value 10 = 10ms. Hosted Cache mode is for location with dedicated file servers. Distributed Caching is for locations without dedicated file servers. BranchCache requires inbound and outbound client firewall rules. c. Add predefined BranchCache rules. BranchCache also accelerates content for web servers and BITS application servers. Simply install the BranchCache feature and ensure the service is running. No other configuration steps are necessary. Problem: Hosted Cache server's SSL certificate expired. New certificate has a different thumbprint. Error when linking the new certificate thumbprint to BranchCache server. Error: SSL Certificate add failed, Error: 183. Cannot create a file when that file already exists. This article explains how to preload content on a BranchCache server. Copy hash package to a temporary directory on the the remotely hosted-cache server. That's it! Branch office users will immediately benefit from this pre-hasing process. Problem: BranchCache services do not work as expected. Background: BranchCache services are installed in a hub and spoke topology; data center serves multiple branch offices. File servers at the data center are enabled as BranchCache content hosts. BranchCache hosted cache servers set-up at each branch office. b) Add the BranchCache counter. d) Transfer data. If BranchCache is working, the above highlighted numbers will increase in real-time. I missed the elephant in the room. The problem was the specific version of Windows 8 used for the tests. Windows 8 Enterprise must be used when working with BranchCache; not Professional. This may seem obvious to anyone that has worked with the 2008R2 and Windows 7 BranchCache; however all the prerequisites from Microsoft simply read, "Windows 8" whereas Microsoft specifically indicated, "Windows 7 Enterprise". DFS Namespace problems at branch offices. Other users may get a "sync status" error, or "offline files unavailable", while connected to the LAN from the branch office. The problem is most like caused because of high latency between the main office and the branch office when DFS Namespace is enabled. Windows Offline files measures for latency and sets the default threshold at 80ms for Windows 7. When the latency from the branch office passed the Offline threshold the DFS namespace directory automatically transitions to offline mode. The Offline Files treats DFS namespace and DFS network shares separately. A namespace can be offline while it's child directories remain online; or vice-verse. Even worse, if a client attempts to access the target Offline, and the target is unavailable, the Windows client interprets the entire namespace as unavailable; and will attempt to open a user’s locally cached files (if they exist). If they don't exist the user will get network unavailable or permission errors. The files never properly transitioned to an online state. Disabling the Offline Mode was the only short-term solution that seemed to correct the DFS namespace problem. This is not practical long-term because staff may want to use the Offline File Sync. BranchCache also has a dependency on the Offline Files service. 2. Installed the Windows Resource Tool, SubinACL, to allow me to take ownership of the Offline cache directories. SubinACL doesn't have to be used but all files are owned by the System; manually changing ownership and permissions would take forever. There may also be a directory for the local namespace file server that should be deleted as well. After ownership has been applied the security for the user must be changed to full or modify. Be sure to apply the change to all child directories or the files cannot be deleted. Things should be back to normal after a restart. I was surprised we hadn't run into this issue earlier. For whatever reason, latency did seem higher than usual when the problem started. To correct the problem the Offline latency threshold limits in either the local or group policy must be set. 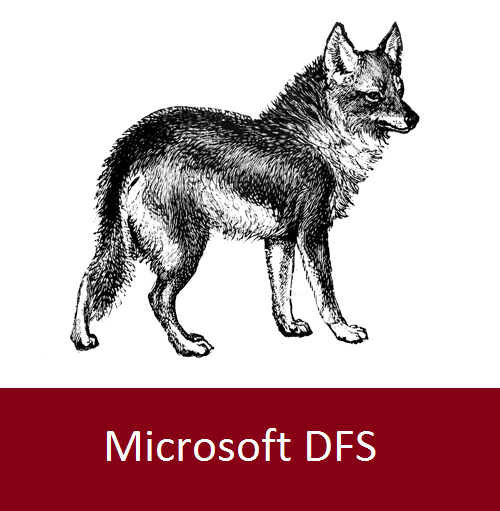 Because this issue can impact any staff, at branch offices, or on VPNs, I recommend this GPO when DFS namespaces are used in correlation with branch offices. My understanding this latency group policy setting is independent from latency settings for BranchCache in Group Policy.